From The New Criterion. February 28, 2014. The centenary year of the outbreak of World War I opened in Britain with an exchange of artillery barrages by the major political parties, each wheeling out its big historical guns on behalf of rival views of the war’s origins and meanings. The initiator of hostilities in this case was the Conservative education minister, Michael Gove, who took on the now rather moth-eaten academic and journalistic consensus about the war as having been something between a mistake and a crime by asking provocatively in The Daily Mail, "Why does the Left insist on belittling true British heroes?" The heroes in question were, of course, British soldiers of the Great War whom a certain historical tendency associated by Mr Gove with the name of Sir Richard Evans, Regius Professor of History at Cambridge, tends to regard as victims or dupes, rather than heroes. "The men who enlisted in 1914," Sir Richard is quoted as having written, "may have thought they were fighting for civilisation, for a better world, a war to end all wars, a war to defend freedom: they were wrong." And, if that seems an unusually positive statement for a historian, Sir Richard is said further to have denounced the alternative view — proleptically, Mr Gove’s view — as "narrow tub-thumping jingoism." The latter’s Labour shadow, Tristram Hunt, himself a professional historian, professed outrage in The Observer at what he saw as his opposite number’s having "politicized" the centenary observances, noting that "the left needs no lessons on ‘the virtues of patriotism, honour and courage’" from the likes of Mr Gove. Yet he himself trod lightly in approaching the question of the war’s alleged futility and stupidity, tacitly conceding Mr Gove’s point about regarding those who fought as heroes and casting doubt instead on his characterization of the conflict as "plainly a just war." This he did by associating that view with the now-deceased German historian Fritz Fischer who, in Germany's Aims in the First World War (1961), placed the blame for the conflict squarely on the shoulders of his fellow countrymen. More recent historians, wrote Mr Hunt, have been inclined to question his findings, assigning at least a share of the blame to Serbia or Russia rather than to Germany alone. Although the Mail’s headline writer stressed Mr Gove’s attack on "the Left," most of the subsequent commentary focused on his mention of a few late-20th century popular cultural manifestations, including most notably the BBC television series "Blackadder," written by Richard Curtis — better known for soppy sentimental comedies like Notting Hill and Love Actually — and the left wing comedian Ben Elton. The recurring character of Blackadder — recurring in several different historical periods — is played by Rowan Atkinson and is a broader and cruder version of George MacDonald Fraser’s Flashman, functioning in all his incarnations as a debunker of a heroic national narrative now known to most people in Britain only through this and other debunkings. Mr Gove’s point in mentioning it was that one series of the franchise, "Blackadder Goes Forth," deals with the First World War and is, apparently, routinely shown to secondary school pupils as part of their studies of the period. Such an uncritical acceptance of the left-wing view of the war in its most simple-minded form as an educational tool might seem scandalous to some, but it appears to be the point at which the Secretary of State for Education alienated the media consensus. 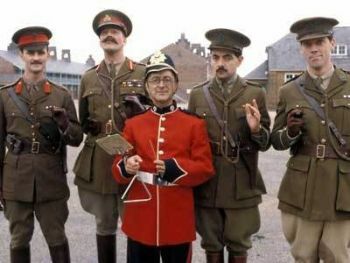 Andrew Critchlow, a former Grenadier Guard and the business news editor of The Daily Telegraph wrote in that paper that the "dark humour and self-deprecating banter among the rank and file" of the British Army was perfectly captured by the "Blackadder" series. "God forbid," he deprecated, "that our children start to take our military institutions, or ourselves for that matter, too seriously, as did Kaiser Wilhelm and the rest of his pointy hat-wearing army junta in 1914. If that happens we really will lose every war that we fight or start them, just like ‘ze Germans’." The idea that there can be no middle way between the Kaiser and Blackadder seems to be a common one, now, in Britain. One senses, as one also does in a column for the same paper by Joan Bakewell, the Labour peer, television personality and sometime lover of Harold Pinter, that "sacred memory" for journalists and literati in Britain today attaches not to the glorious dead of generations past but to the "anti-establishment" mind-set of the 1960s "satire" boom, led by certain "bright young people in the media," in Baroness Bakewell’s words, of which she was one. "Whatever happened to respect?" she asks. "The answer is that it went, chucked out in the Sixties, along with a whole heap of hypocrisy and snobbery, secret discriminations and class hierarchies, rendered out-of-date by the churn of war." Of course the absurd progressive idea that respect, let alone reverence, must be out of date was precisely what Mr Gove had been protesting against. Sir Richard Evans himself appeared to be not all that keen to claim kinship with "Blackadder." Stung, perhaps, by Mr Gove’s characterization of his arguments as being "more reflective of the attitude of an undergraduate cynic playing to the gallery in a Cambridge Footlights revue rather than a sober academic contributing to a proper historical debate," the professor denied that he thought "Blackadder" to be suitable teaching material, though he thought it entertaining enough and harmless if watched by children in private, at home. "Both Mr Gove and ‘Blackadder’ he sniffed, "have too narrow a view of the war." It was a neat attempt at reversal but an evasion both of the criticism and of the question of how justified and patriotic, if at all, were those who had fought in the war. Both he and Mr Hunt were at one with the defenders of "Blackadder" in seeming to imply that there was on the left no such view of the war or its British combatants as Mr Gove had alleged, or that everyone recognized it as merely a joke. But elsewhere there was plenty of evidence of the attitude he had criticized. Seumas Milne, a far left apologist for Communists and al-Qaeda terrorists, wrote in the Guardian that the heroic version of the war’s history was "preposterous nonsense," insisting that, "Unlike the second world war, the bloodbath of 1914-18 was not a just war. It was a savage industrial slaughter perpetrated by a gang of predatory imperial powers, locked in a deadly struggle to capture and carve up territories, markets and resources." Meanwhile, The New Statesman suggested that the mere mention of patriotism and justice in connection with the war was a scandal, headlining: "Michael Gove defends deaths of 37 million [sic] people as ‘just’." From the cis-Atlantic point of view the controversy itself and its spillover into the popular media might have been thought more interesting than the rights or wrongs of either side. Read closely, both Mr Gove and many of his detractors — the Prime Minister and the Mayor of London were both among those who took up the cudgels on his behalf — were in any case saying not such different things, which could be synthesized into a warning that we would do well in our commemoration of the now century-old sacrifices of so many not to oversimplify what it was all about or to pronounce too readily the judgment of hindsight on those who fought the war. But the headline-writer for The New Statesman was just one of those who was offended by what might otherwise have seemed this unremarkable call for restraint and humility in our attitude towards the past. There would, I suspect, have been more like him in the U.S.
For in Britain, however much they may denigrate or ridicule opposing points of view, at least they appear to recognize that opposing points of view exist. The past is a living thing, even to the presumptively down-market readers of The Daily Mail. In America, the progressive triumph in the media and academia is so complete that people are beginning to lose their awareness that there are any opposing points of view about the past, or at least any legitimate ones. Professional historians have largely reduced it to some variation of the Marxist dialectic — a long cycle of oppression and revolt leading ultimately to, well, today — and, having thus reassured us that we are on the path to enlightenment and earthly perfection, they may safely assume that history has no further usefulness to or relevance in our lives. When it comes to things that people can remember, however, the historians’ job becomes that of gentle persuasion to make sure that we remember things the right way. To many Americans (wrote Annie Lowrey), the war on poverty declared 50 years ago by President Lyndon B. Johnson has largely failed. The poverty rate has fallen only to 15 percent from 19 percent in two generations, and 46 million Americans live in households where the government considers their income scarcely adequate. But looked at a different way, the federal government has succeeded in preventing the poverty rate from climbing far higher. There is broad consensus that the social welfare programs created since the New Deal have hugely improved living conditions for low-income Americans. At the same time, in recent decades, most of the gains from the private economy have gone to those at the top of the income ladder. Readers of this magazine scarcely need to be told what The New York Times means when it refers to "broad consensus." The Times itself is the ultimate consensus builder, and its purpose in building it here, as elsewhere, is to imply that there can be no respectable opinion contrary to the consensus as they see it. Even something believed not just by "many" but by most Americans can easily fall foul of one of The New York Times’s powerful, ungainsayable consensuses. Only a few days before Miss Lowrey put the presumptively unanswerable case for the success of the War on Poverty, the Times had published 8000 words of careful research by David D. Kirkpatrick purporting to demonstrate that the recently formed consensus about the murder of the U.S. ambassador and three others in Benghazi, Libya, on September 11, 2012 should now be regarded as discredited, and that the new consensus must be the same as the old consensus, previously itself thought to have been discredited but now re-credited by Mr Kirkpatrick’s labors. This was that the Obama administration’s version of the events as having been caused by a spontaneous eruption of pious outrage at the insult to Islam of a YouTube video made by a hitherto unknown Coptic Christian and amateur film-maker in California and nothing to do with al-Qaeda was substantially correct. As with the sudden, retrospective success of the War on Poverty, the new consensus being promoted by the Times happened to coincide with the interests of the Democratic Party, former Secretary of State and possible presidential candidate Hillary Clinton and President Obama, the launch of whose own war on poverty coincided with Miss Lowrey’s consensus building article. This took the form of a campaign to extend unemployment benefits to the long-term unemployed as well as, in the Times’s words "for universal preschool, an increase in the minimum wage and an administration effort to make college less expensive for the middle class." History, we see, does have its uses when it demonstrates the likelihood of success for such well-meaning government efforts as these. Of course that usefulness depends on the certainty of its conclusions, but that has never been a problem for the Times, all of whose conclusions are pronounced with apodictic certainty. In 2004, Mr. Simmons donated $2 million to the Swift Boat Veterans for Truth, whose advertisements against Mr. Kerry, the Democratic candidate for president, included one impugning his military service as a Swift boat captain during the Vietnam War. The allegations were later discredited. Ah, so The New York Times’s view of the matter was again vindicated by an unnamed but presumably authoritative historian, was it? How often that seems to happen! A few days later, the lead of Jonathan Weisman’s piece on the scaling down of election year legislative ambition on the part of Republicans in the House of Representatives read: "The ‘do nothing’ Congress is preparing to do even less." The words in quotation marks are, of course, part of an election year slogan of Democrats which was (and remains) a rather feeble borrowing from Harry Truman in 1948. Feeble, that is, not only because it is a re-tread but because it sorts very oddly with another Democratic message amounting to a charge that the Congress has done (or tried to do) far too much. Yet to The New York Times the soubriquet has the force not just of received opinion but of mere fact. It is of course no more news than the biases themselves that the Times no longer even goes through the motions of attempting to hide them, but the posture of treating as fact what is manifestly not fact but opinion is further evidence of the socialization of truth in our media culture. Objectivity itself has been re-defined to mean that which proceeds from a trusted brand such as The New York Times, trust in which is founded on a pre-existing political consensus that then generates further consensus as necessary. Opinion itself disappears, along with any but the most trivial forms of dissent. That is the necessary assumption behind outrage over the "politicization" of history. Politics itself is now understood not as conflict but as settled truth, the denial of which can only come from those, ipso facto, already "discredited." And the power of crediting and discrediting belongs to the media because of the media’s own heroic narrative as the advocate of the oppressed and the seeker out of scandal and corruption among the powerful. Come to think of it, that narrative is itself just about half a century old. And yet there are no celebrations.